Just a few words about this route: the names of the places we are going to cross are enough to understand the beauty of this itinerary. From Villa Guerrina we head to Colognola ai Colli, then all the way to the east, to Bassano del Grappa and its beautiful bridge, Valstagna and then up the “Scala di Primolano”, a nice climb that leads us at the bottom of the Dolomites. And then, it’s just majestic mountains, silence, peace and great skies. 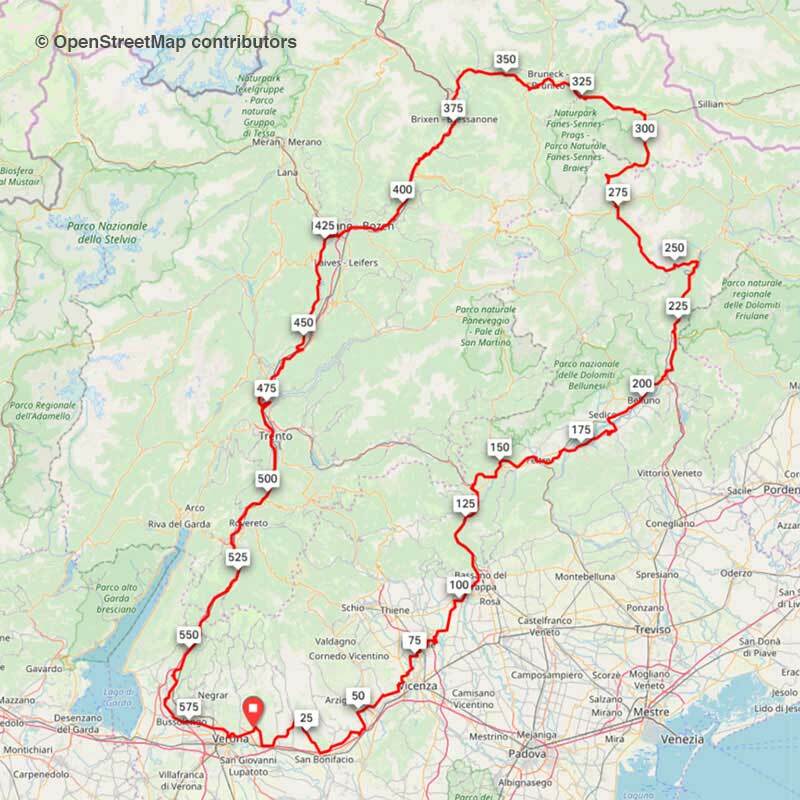 We cycle on bike paths and small country roads, we cross Feltre, Ponte delle Alpi, the old Alemagna road and finally up on the Lunga Via delle Dolomiti (the Long Dolomites Way), from Calalzo to Cortina, in the Ampezzane Dolomites Park, until we get to Dobbiamo. The itinerary continues on the beautiful Val Pusteria bike path, crossing the charming villages, such as Brunico and Bressanone. We keep going south, we cross the Lake Caldaro, then all the way down through the river Adige valley, and finally Verona again and the epic arrival in Villa Guerrina in Montorio. We would like to thank the Banco BMP - Banca Popolare of Verona again, and its wonderful Cral, for the help in organising The Wonderful Four. Distance 580 km, altitude + 3.700. Extremely beautiful. When: from Friday 24th to Sunday 26th May 2019. What to do: Friday, 24th May 2019, yellow cards are given at the organisation tables from 16:00 to 20:00. Departure: Saturday 25th May from 5:00 h to 5.30 h.
Arrival: Sunday, 26th May within 21:00. BREVET BRI/ARI | Brevet Randonneurs Italia. Check-points for card control: in some of them refreshments are given. Refreshments are at the expences of the participants. Dueville (VI) – 81 km – Cicli Rossi (refreshments courtesy of Sport Verona - mechanical assistance): Via Giovanni Pascoli, 38 Povolaro. Feltre (BL) – 160 km – Ristorante Alla Bella Napoli (refreshments): Via Trevigiana, 13. Tai di Cadore (BL) – 245 km – Ice Bar Funivia (refreshments): Lungadige Monte Grappa, 1. Villabassa (BZ) - 315 km - Ristorante Pizzeria Mexico City (refreshments): Via Rienza, 27. Bressanone (BZ) - 370 km - Ristorante Pizzeria Mare e Monti (refreshments): Via Roncato, 9. Faedo (TN) – 460 km – Bike Break - Bicigrill Faedo (refreshments): Loc. Masetto, 8. Overnight in Municipality of Villabassa's sport center (gym). The Municipality of Villabassa offers to all participants the overnight by its gym, with wooden floor, warm showers. There is also place for bike storage. Transport of small luggages from Verona to Villabassa and back. Participants can give us a small luggage with sleeping bag, sleeping mat, towel and spare clothes. Name/surname and telephone number must be written on the luggage. The luggage is delivered in the gym of Villabassa, collected in the morning at 6:00 am and delivered back in Verona. Pasta party at the arrival, from 10:00 to 19:00. Refreshments are not included and are at the own expences. 1. For free, in Municipality of Villabassa public gym, with wooden floor and warm showers. There is place inside for bike storage. 2. Hotel Pension Kuhbacker**, about 500 mt far from the check-point, average prices. Check-in at any time, breakfast also in the very early morning. Participants must book directly, informing that they are cyclists or partner. The hotel also offers restaurant service. Please keep in mind Villabassa for your mountain holidays. As you will see during the randonnée, Villabassa is a beautiful and calm village in the middle of Pustertal, it features any confort at it is at the steps of the beautiful Dolomites. The Dolomiti Superbike is organised here every year, a legendary mountain bike race. The tourist office in Villabassa can give you information and support for the organisation or your holiday. Gpx tracks and road book available from Saturday, 11th May. There are two different gpx tracks: one has the whole itinerary, in the other one the itinerary is fragmented in sections from check-point to check-point. Road book will not be available on the day of the randonnée, you have to print it by yourself.